Step 1: Make the burgers. Place the lamb, onion, garlic, mint, parsley, oregano and salt and pepper in a mixing bowl and stir with a wooden spoon to mix. Divide the mixture in four portions and shape into patties. 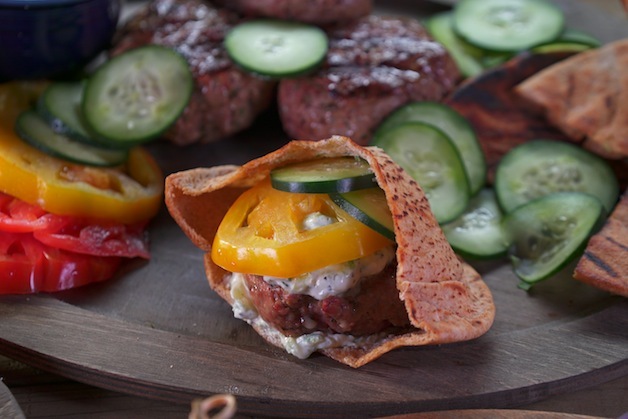 Arrange the burgers on a plate lined with plastic wrap and refrigerate until grilling. Make the Yogurt Cucumber Sauce. Step 2: Set up your grill for direct grilling and preheat to high. Brush and oil the grill grate. Generously season the burgers with salt and pepper on both sides, then place on the hot grate. Grill the burgers until cooked through, 4 to 6 minutes per side for medium. To test for doneness, insert an instant-read meat thermometer though the side of a burger into the center: The internal temperature should be about 160°F for medium. Warm the pita breads on the grill. Step 3: To serve, open the pita breads through one side. Place a lettuce leaf inside, followed by a burger, some cucumber and tomato slices and a generous dollop of yogurt sauce. Dig in!